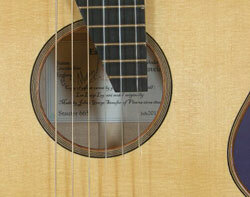 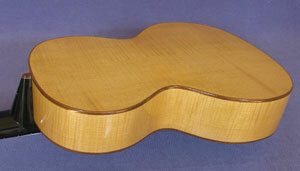 The design of the rosette is refected in the purfling around the edge of the soundboard. 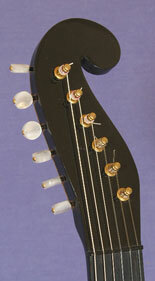 Adjustable neck mechanism via bolt and key (key is removable) for string height by the luthier. 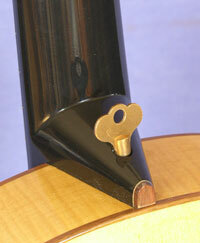 Six ebony bridge pins with mother-of-pearl eye. 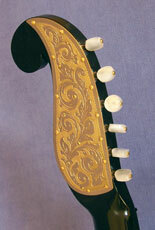 this includes a hidden V-joint from the neck to the head and an adjustable neck which is locked to the body with a bolt through the heel which is secured tightly with a removable brass key. 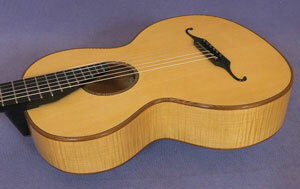 The maker of this copy, is indebted to Pavel for allowing access to his guitar.